Ahh, student loans. If you have them, you’re not alone—40 million other Americans are shouldering an average of $28,400 in student loan debt. But like any debt, too much isn’t a good thing, so paying them off as soon as possible is a worthy goal. Most of us know that the key to paying off any debt faster is to always, always, always pay more than the minimum amount. Any amount over the minimum goes straight to the principal, which means you pay the loan off faster and save more money in interest. But, this is easier said than done, especially when money is tight or you’re tempted by other things to spend your money on. This is one of those times it pays to think outside the box. 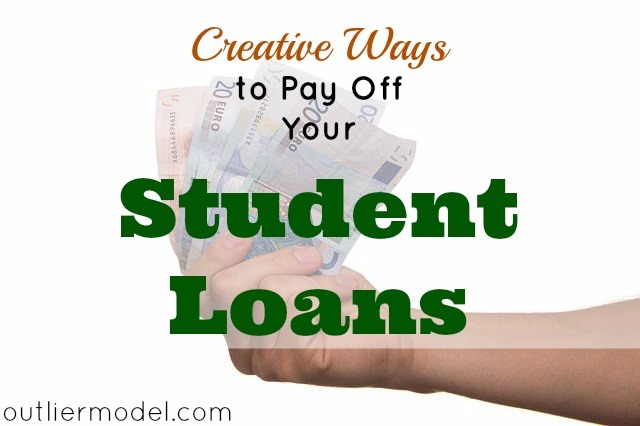 Here are five creative ways to pay off your student loans. Find ways to stay motivated. I personally love the payoff calculator here. It’s amazing (and motivating!) to see how much faster you can pay your loan off and how much money you can save just by paying a little extra each month. For example, let’s say you have a $20,000 balance at a 6.8% interest rate and a 10-year loan term. Just $15 more a month pays your loan off 10 months faster and saves $931 in interest. Pay $50 more a month, and you’ll pay it off 2 years faster, saving $2,146 in interest. Play around with different amounts, and keep a reminder or running tally of your balance where you can see it. Get a roommate or two. Depending on a few factors (like how much you’re willing to sacrifice to pay off your loans and whether or not you have a spouse or kids), splitting housing costs with roommates will save a bundle not only on rent or mortgage, but on the utilities as well. Putting that extra few hundred dollars a month towards your loan can shave years off your payoff date. Start before you graduate. With unsubsidized loans, the interest rate clock starts ticking before you even graduate. 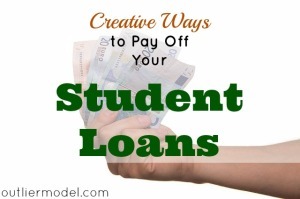 When you graduate, the interest that is accrued is added to your total loan balance. Even if funds are tight, repaying your loan before you graduate—even if the amount is minimal—can cut down on the amount of your loan when you graduate, resulting in faster payoff. Look into government forgiveness programs. Depending on your profession, you may be eligible for a loan forgiveness program. The Public Service Loan Forgiveness Program (PSLFP) forgives the remainder of your loan balance after 10 years if you work in a public service field, such as law enforcement, nursing, legal services, public libraries, and more. Teachers may be eligible for up to $5,000 in loan forgiveness if they teach 5 years in an elementary or secondary school, or up to $17,500 if they teach math, science, or special education. Have your payments automatically deducted. Figure out how much more extra you can afford to pay towards your loans, then have that amount automatically deducted from your account each month. The old saying “out of sight, out of mind” really works here. Paying off student loans quickly requires a little creativity and some serious motivation, but it’s worth it in the end. Do you have any tips for paying off your loans? Share them in the comments!